Experiential learning, seminars, case studies involve students in open discussions on Food safety. Furthermore, participants present, in a specific session, the results of their research activities. The faculty is composed by academic staff of the two organizing universities, by EFSA officers and by academics and scientists with outstanding experience in food safety. The Summer school is specifically devoted to PhD students at their last year of study and to recently PhD (max 2 years after thesis defense). The participation is open to PhD students and graduates from EU countries, from Candidate-Potential Candidates Countries (Albania, the former Yugoslav Republic of Macedonia, Montenegro, Serbia, Turkey, Bosnia and Herzegovina, Kosovo) and neighbourhood countries (Algeria, Egypt, Lebanon, Palestine, Armenia, Georgia, Libya, Syria, Azerbaijan, Israel, Moldova, Tunisia. Belarus, Jordan, Morocco, Ukraine). The deadline for applications for the summer school is May 20, 2016. 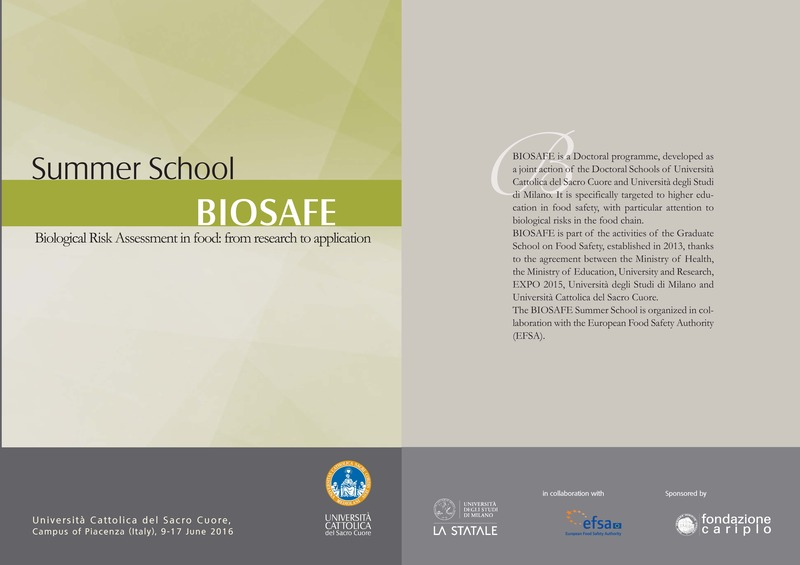 Applicants from universities of BIOSAFE project must coordinate their application with their institutional coordinators. All applicants will be informed about the selection of participants in late May. The working language of the summer school is English; therefore, a sufficient understanding and ability to express oneself in this language is required.